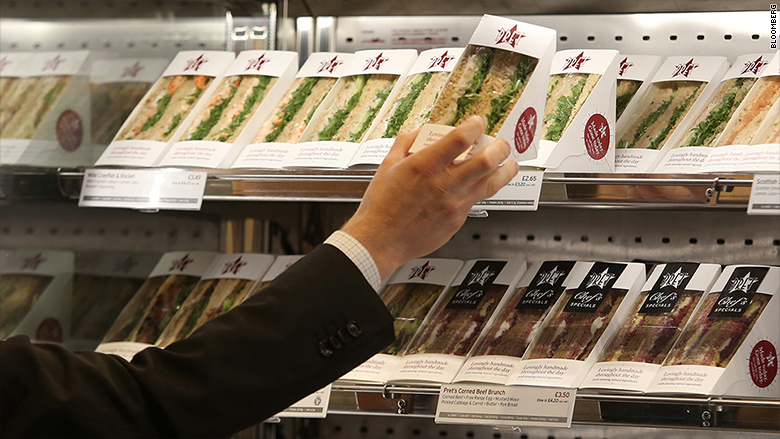 British based Pret a Manger sandwich shops are a big hit in the U.S.
Americans are falling in love with a British sandwich chain. Pret A Manger reported record sales on Tuesday, thanks to a boom in its American business. "The highlights were a strong performance in the U.S. -- our newly opened Penn Station shop has the highest sales per square foot of any Pret in the world," said Clive Schlee, Pret's CEO. The U.S. was Pret's fastest growing market in 2015. Its like for like sales, which exclude new shops, grew 13.8% in the U.S. last year, the company said in a statement. Pret said demand for salads and breakfast items, including its organic coffee, was driving the increase. The company's U.S. operation has grown into a $200 million business since it launched its first sandwich shop in New York 15 years ago. Schlee said the company had to adapt to succeed in the U.S., like allowing American customers to customize hot drinks and salad dressings. "Americans want to choose their own from a large range whereas Brits are happy to let Pret decide," Schlee wrote in a blog. He also said Pret offers more choices in the U.S. because "American customers love to mix and match side items like side soups, protein pots and single sandwiches." The chain opened six new shops in the U.S. in 2015, bringing the total to 65 stores across New York, Washington, Boston and Chicago. Pret operates 399 shops in the U.K., U.S., Paris, Hong Kong and Shanghai. Its sales globally reached £676.2 million ($973 million) in 2015, with profits jumping 14.5% to £84.3 million.